Anna Real Cooking info about the game-Games2Rule. 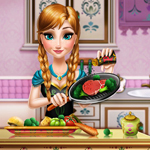 Our quirky princess Anna wants to become a great chef and needs your help in the kitchen to create an original recipe. Pick your ingredients from the fridge and cook them any way you`d like it. Boil, fry or chop the food to perfection, add salt and pepper, then let Anna taste your delicious dish and amaze her with your culinary talent.